All the private and government sector recognized colleges in Karachi open admissions in Intermediate part 1 in July-August soon after the declaration of matriculation annual exams result. For this purpose, these colleges also published admission advertisements in the top leading newspapers of the country and also on their website. 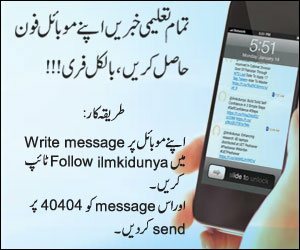 Ilmkidunya also upload the admission advertisements of these colleges and you can see these advertisements below. On this page we have published intermediate level admission guide for the convenience of aspirants who have passed their matric exams and now planning to get admission in inter level. All the government and private colleges offers six courses at intermediate level from which the aspirants chooses the one according to their interest. If they wish to become a doctor and they have studied science subjects at matric level then they choose FSc Pre-Medical at inter level and if they wish to become a future engineer then they choose Pre-engineering course to study at intermediate level. The merit criteria set by the colleges for all these groups is different. The merit criteria for pre-medical and pre-engineering is always high as compared to the merit criteria for other courses. All the colleges when open admissions in intermediate level, they published advertisements in the most reading newspapers of the country. We also published admission advertisements of different colleges and you can check these advertisements here on this page. Admission advertisements are usually published in July or August just after the declaration of matric result. After the selection of best colleges for you, you are required to apply in those colleges for the programs that you wish to study. Collect the prospectuses along with application form on the given dates from the admission office of those colleges or from the allotted bank branches after paying form fee. After filling the application form submit it to the place from where you have collected within the given time. The colleges display 2 or 3 lists of selected candidates for both morning and evening shifts after 7 to 8 days of submitting application forms. Afterwards, the selected candidates submit tuition fee along with other dues to enroll themselves in the respective college. Sir meri metric 2014 ki hy ma 1st year ma pre medical ma addmision lesakta ho k nahi?